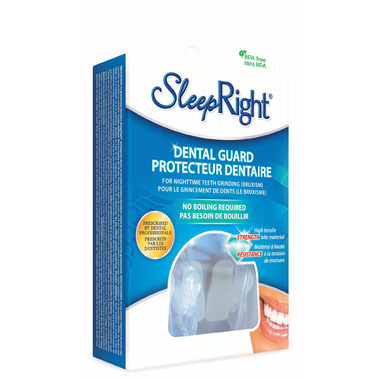 The SleepRight® NO-BOIL Dental Guard gives your teeth something to smile about. It protects your teeth by preventing grinding and clenching. It’s patented self-adjustable technology means no boiling or microwaving required for fitting – it’s ready to use right out of the package. The soft, thermal band conforms to your mouth using body temperature, while the bite pads automatically swivel to match your bite for a custom fit. This fantastic! I have been buying mouth guards for years as I clench my teeth at night. Most mouth guards are clumsy and you need to soak in hot water first for them to take an impression. these fit perfectly with 3 different adjustments, Good job !!!! !